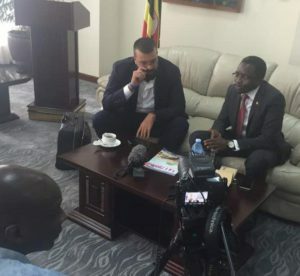 Omona (right) with the Lebanese secretary general Ahmed Mustafa Elhariri at Entebbe Airport. Courtesy photo. The secretary general of the Future Movement Party, a ruling Political Party in Lebanon, Ahmed Mustafa Elhariri, this afternoon arrived in the country for a four-day official duties. 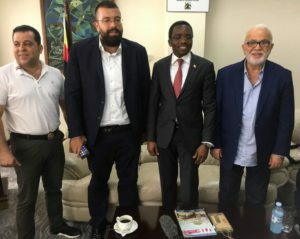 At Entebbe International Airport, Elhariri was received by NRM deputy National Treasurer Dr Kenneth Omona, who represented NRM party’s secretary general Justine Kasule Lumumba. Elhariri is expected to meet President Museveni, the NRM party chairman On Thursday this week, at State House, Entebbe. According to Rogers Mulindwa, the communication officer, Elhariri led a delegation of about 20 potential investors. Interacting with the visitors, Omona said the delegation is here to meet President Museveni, the NRM national chairman. The meeting is scheduled for Thursday afternoon at State House, Entebbe. On arrival, Omona entertained his guests with a brief political history of Uganda at the Airport V.I.P Press room before driving to Kampala. Future Movement Party secretary general Ahmed Mustafa Elhariri (2nd left), Omona (2nd right) and other Lebanese delegates at the Airport. Future Movement is Lebanese political movement led by MP Saad Hariri, the younger son of the assassinated former Prime Minister of Lebanon, Rafic Hariri. The movement is the largest member of the March 14 Alliance, which won a majority of the seats in the 2009 parliamentary elections.